The vast and sensational Serengeti, covering 14,763 sq km of endlessly rolling savannah plains, is Tanzania's first-established, largest and most famous park wherein tens of thousands of hoofed animals roam in a constant and unremitting search for the fresh grasslands upon which their survival depends. The million-plus wildebeest are the predominant herbivore and also the main prey of a huge cast of large carnivores, principally lion and hyena. Whilst the annual migration is the Serengeti's most famous attraction, the Park is also renowned for its lion, many of which have been fitted with radio-transmitter collars so that their movements may be tracked, and additionally for its wealth of cheetah, zebra, giraffe, Thomson's and Grant's gazelle, eland, impala, klipspringer, hippo and warthog. Finally, the Serengeti, whose Maasai name 'Siringet' translates as 'the endless plains', offers unparalleled ornithological opportunities and an unrivalled natural arena wherein the glory and harmony of nature can be appreciated as nowhere else on earth. Life in the Serengeti is a complex and dynamic ecological system in which all the animals and plants interact both with each other and with their environment. No organism is static or exists in isolation and all are dependant on the rains. The park is made up of several different vegetation zones: in the dry south are the short and long grassland plains, where an average of only 50cm of rain falls per year. In the centre lies an area of acacia savannah whilst the western corridor marks a region of wooded highlands and 'black cotton' soil curving in a great swathe to the edge of Lake Victoria. To the north is wooded grassland, which concentrates along the watercourses and tributaries of the Grumeti and Mara Rivers. Twice a year, propelled by the rains, 1.3 million wildebeest, 200,000 zebra and 300,000 Thomson's gazelle gather to undertake an 800 km trek to new grazing lands. The precise timing of the migration varies but generally the herbivores congregate and move out at the end of May, sometimes over a period of weeks, sometimes over a period of as little as three or four days. They then head west on the first leg of a roughly triangular 800-km circuit that takes approximately 3-4 months and ends in the Masai Mara National Reserve of Kenya. When the grazing here is exhausted the tide of herbivores turns and reverses its progress returning to the short grass plains of Tanzania. There are two distinct seasons: the dry season between June and October and the wet season, which starts in November and lasts irregularly until May. Approximately one hundred years ago, the warlike Maasai first arrived in the Serengeti, bringing their cattle to graze on the rich grasslands. Prior to this the region was uninhabited and visited only by the hunter-gatherer Ndorobo and Ikoma tribes. The Maasai were followed, in 1913, by the Europeans, who were so quick to assess its game-hunting potential that, by 1921, the Serengeti's teeming herds had been almost entirely decimated. This necessitated the establishment, firstly of a Reserve and finally, in 1951, a National Park. 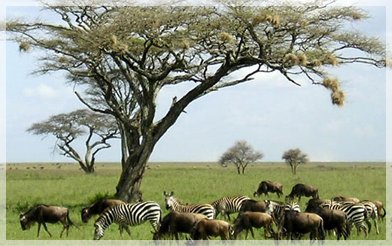 As a result the Serengeti is an area where human habitation is prohibited. The Serengeti National Park can be visited at any time of year but the wildlife concentrations are greatest between December to May.